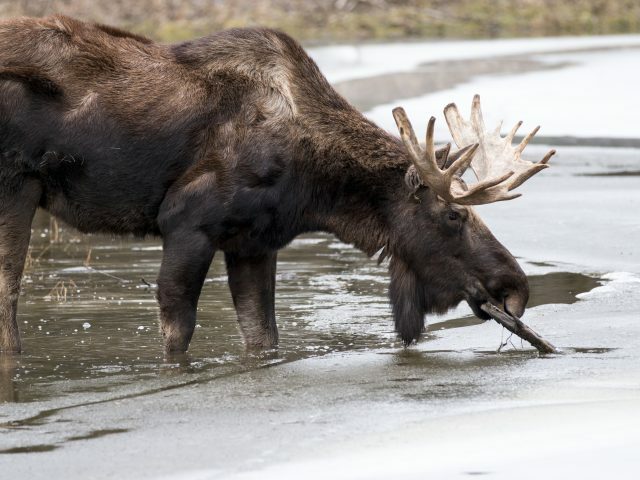 The Alaskan Moose are long-legged and heavy bodied with a drooping nose. Under their chin they have a fold of hair-covered skin called a dewlap or bell. Alaskan moose also have a short tail. Their coats range in color from golden brown to black, depending on the season and the age of the animal. Newborn calves are typically a red-brown, which fades to a lighter rust color within a few weeks. Their large antlers make them easily recognized but are only carried by males. The largest sized antlers (trophy size) are usually developed by ages 10-12. The Alaskan Moose is highly active during the day, especially at dawn and dusk. They are very good swimmers and can swim as fast as six miles per hour. They generally only encounter other moose for mating and courtship. They are known to be peaceful animals but can become aggressive if they feel threatened. One threat to the species is being orphaned at a young age. 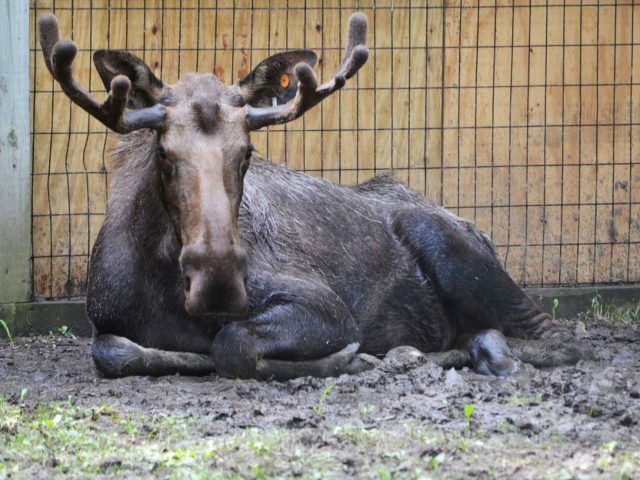 We have two Alaskan Moose here at Potter Park Zoo who were both brought to the zoo after being separated from their mothers in Alaska. One challenge moose face in the U.S. are ticks. Scientists hypothesize that the pest is killing about 70% of moose calves in certain areas of the US. The tick problem is being aided by warming temperatures and shorter winters that allow the parasites to survive longer. Learn more from National Geographic here and the Boston Globe here. Michigan’s Isle Royale is famous for the predatory prey system involving wolves and moose. With only two wolves left to feast on them, the moose of Isle Royale National Park are undergoing a population explosion that could endanger the wilderness area’s fir trees and eventually cause many of the moose to starve, scientists said today. 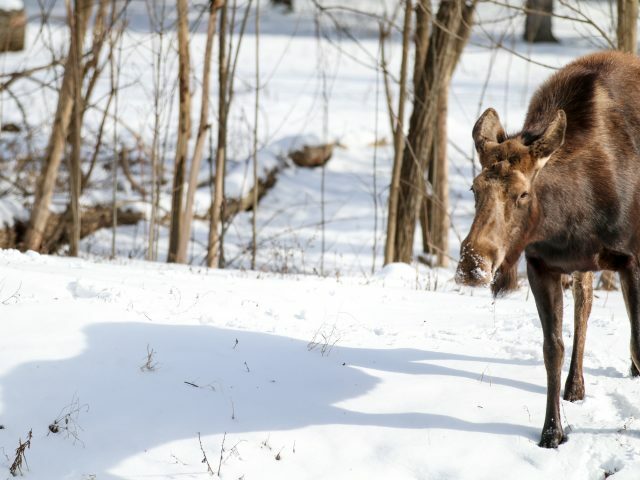 Learn more about these Michigan Moose here. What YOU can do to help: Reduce the effects of global warming. Pull the plugs of devices when not in use, use LED light bulbs, and consume food responsibly (about 10% of energy use goes into growing and processing food). Learn more here. The Alaskan Moose is known as moose across North America, but called elk in Europe. Moose communicate through a variety of vocalization, noises, body positioning, and odors. A mature female moose is called a cow, and can birth one to two calves. 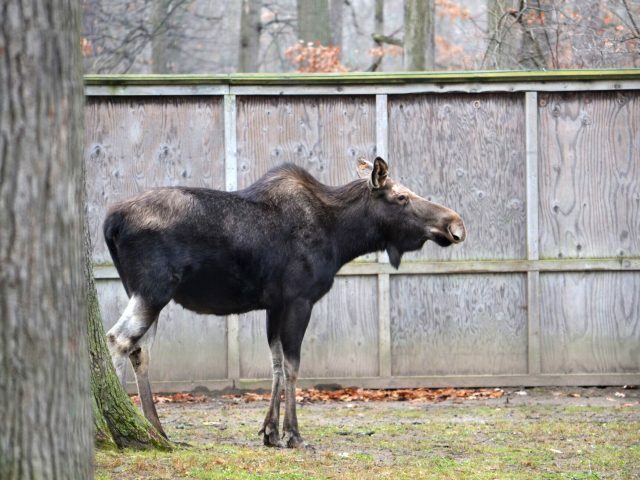 We have two Alaskan Moose here at Potter Park Zoo. Willow, our female, was named for one of the primary elements in her diet, willow branches. She was born in May of 2013, and brought to the zoo after being orphaned in Alaska. Meeko, our male, was also brought to the zoo after being orphaned in Alaska. He was born in the spring of 2014. On average, an adult moose stands 5 to 7 feet at the shoulder. In prime condition adult males weigh from 1,200 to 1,600 pounds, and females weigh 800 to 1,300 pounds. Herbivorous, eats willow, birch, and aspen leaves and twigs, in addition to sedges, Equisetum, pond weeds, and grasses.